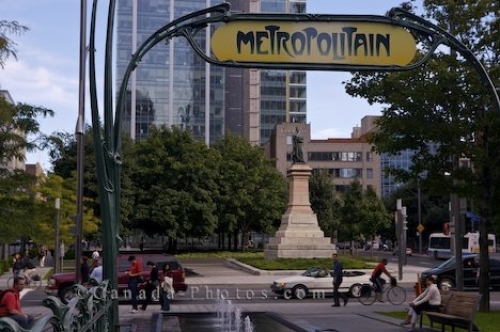 A sign displayed above the entrance to the Montreal Metro in Square Victoria in Montreal, Quebec in Canada. Above the stairwell entrance to the Montreal Metro in Square Victoria in Montreal, Quebec, people sit on the benches while others stroll or bike by. In the backdrop, a statue of Queen Victoria has been erected as the square is named for Victoria Square but was renamed for Queen Victoria when the Prince of Wales visited Montreal in 1860. Picture of the Metropolitain sign above the stairwell to the metro in Square Victoria in Montreal, Quebec in Canada.